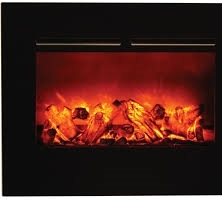 Amantii (ZECL-30-3226-BG) Electric fireplace FLOOR MODEL SALE. This Zero-Clearance electric fireplace includes: Log Set, 3 different coloured Fire Crystals, Heater and Remote Control for flames and heater. The insert works with or without the heater. It has a Black Glass front and LED technology for the flame effects.